We published the results of our board visibility research a few weeks ago with some startling findings about the visibility and transparency of boards across the UK. Knowing who is saying what at a senior level, is important for both compliance and for establishing good behaviour across an organisation. It may surprise you to learn that our survey of 1,000 UK employees across a variety of sectors revealed that 39% could not name a single member of the board at their company. This figure is bad enough, however, when focusing only on workers in Scotland, this figure rises to 44%, highlighting that things are much worse north of the border. More than one-third of respondents said that they do not understand what their company’s vision and values are, suggesting that Scottish organisations need to work harder at bridging the gap between leadership teams and employees. Around half of those surveyed were in the dark about board decisions, feeling those decisions were not clearly communicated to the rest of the company. 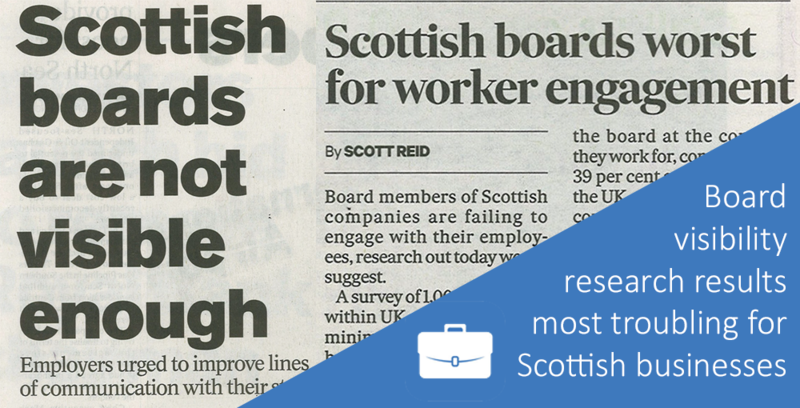 These results were startling enough to receive coverage in two of Scotland’s leading newspapers, The Scotsman and The Herald. We know how real the issue of governance and transparency is within many organisations, it’s the very reason that BoardPacks was created, and is being continually updated as new issues and governance criteria arises. Whilst BoardPacks has been adopted by many organisations across varying sectors, more companies need the BoardPacks solution if our research is anything to go by. In terms of specific roles within a board, the Chief Executive Officer (CEO) was most visible to Scottish employees, although only 33% could name the CEO at their company. The least visible was the chairperson, with only 7% able to identify that role in their organization. 15% are able to identify the Chief Information Officer (CIO), 8% the Chief Financial Officer (CFO), and 12% able to identify the Chief Marketing Officer (CMO). The company secretary is becoming a much more visible role in companies generally, yet only 16% of Scottish workers were able to name their company secretary. Company secretaries are under growing pressure as their job role becomes increasingly more varied and complex, a subject that we have recently discussed in a white paper. 60% of those surveyed felt that worker representation in the boardroom would be a good thing, and a lack of board diversity was a common theme amongst respondents. 70% say there is a woman on the board at their organization (compared to 63% overall), but 40% say there is no-one under the age of 40 and 33% say there is no ethnic diversity, compared to 58% and 55% respectively in the rest of the UK. 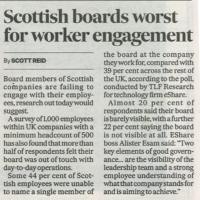 “It is fair to say that a majority of boards in Scotland are comprised of a very similar demographic, so it is not surprising that many workers feel their board could be more diverse.” said eShare CEO Alister Esam. If you would like to hear more about the Scottish element of our research, or are interested in learning more about BoardPacks and how it can help your business, do get in touch with Dominic. Simon Dickinson posted on 10/05/17 - 7:31 am & filed under Governance News.